Keto chicken parmesan is a quick, easy, and delicious recipe to make for dinner. 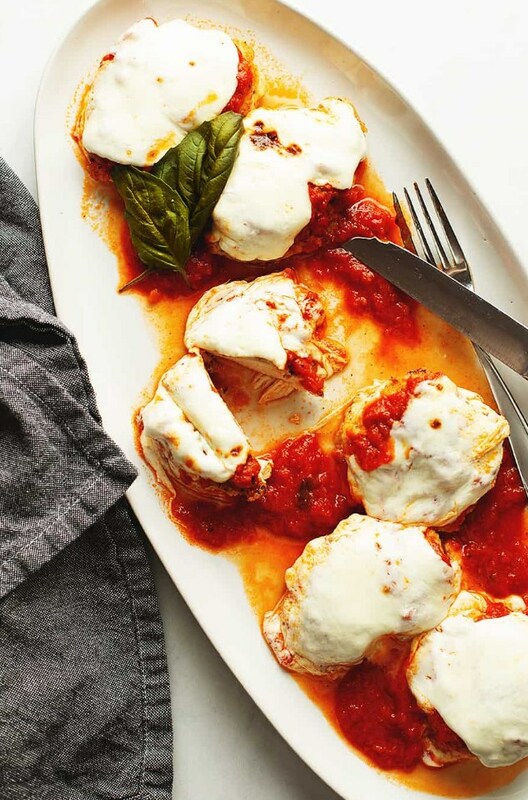 Thin chicken breasts are crusted in parmesan cheese, pan fried until golden brown, then topped with marinara and melty mozzarella cheese! Combine the eggs and the Italian seasoning in medium sized bowl. Add the Parmesan cheese to another bowl. Coat the chicken cutlets in the egg mixtures, then into the parmesan, being sure to coat the chicken well. Spray the skillet with cooking spray and cook the coated chicken on each side for 3 minutes. Remove to a baking dish. Spoon 2 tablespoons of marinara on top of each cutlet, followed by 2 ounces of fresh mozzarella. You can use shredded mozzarella for the topping. Use 2 tablespoons per breast. The perfect parmesan for this recipe is the pre-shredded kind. I used Kraft brand.